@Melbourne | Get Your Grub On! I was on my way home from a short business trip to Melbourne and didn’t have a single meat pie during my whole stay. I knew there was one cafe at Tullamarine Airport that had one just perfect for my last minute fix but when I finally arrived there I had to realize that the cafe had turned into an Italian deli. After searching the entire airport in vain for pie I finally capitulated and was pretty disappointed, it was an Australian airport after all. Thankfully I passed ‘Bar Pulpo’ which offered ‘Bocadillos‘ the tasty sandwiches I new from Spain. I went for the ‘Serrano with Zamora Cheese‘ and asked them to put it into the oven quickly so the cheese could melt. This thing was beautiful. 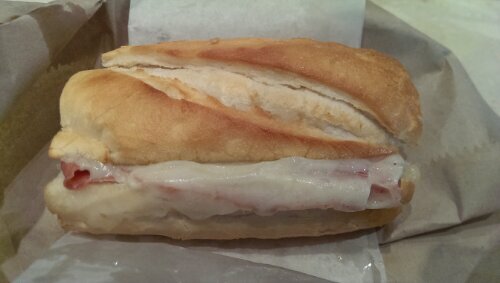 The generous slab of serrano ham was lovely nutty and the cheese added it’s deep salty but not overpowering taste. This all in a perfect piece of baguette which had it’s own taste, nicely spiced and soft and firm at the same time. I just say I entered the plane very happy and content so I would recommend this to any hungry traveller passing through here.